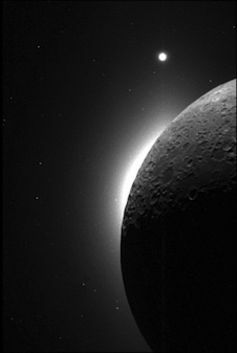 Astronauts on the early Apollo missions orbiting over to the dark side of the moon were surprised to discover a mysterious, bright crescent of light glowing at the horizon. The controversial explanation was sunlight scattered by dust high in the Moon’s tenuous atmosphere, but proof has been hard to come by. Fast forward half a century and, for the first time, a team of scientists has analysed the Moon’s atmospheric dust in real time, discovering a permanent dust cloud. Surprisingly, however, they have failed to explain the glow. At 384,400 km away, the Moon is our nearest planetary neighbour. It is the only celestial body that humans have set foot on and has it provided a natural tool for understanding the origin of water on Earth, the physics of our Sun and for testing fundamental theories of physics. It has even been discussed as a possible alternative home for humanity. Despite its proximity, there’s a lot we don’t know about the Moon – in particular about its atmosphere. The glow was first spotted in 1966 and 1968 by cameras onboard NASA’s Surveyer landers – the robotic precursors to manned Apollo landings. It has later been seen by astronauts on some Apollo missions, but not all. The white area on the edge of the moon is the glow, and the bright dot at the top is the planet Venus. The team of scientists trying to understand the dust environment of the Moon, including the lunar glow, discovered a permanent, elongated cloud of dust around the Moon at heights between 10 to 260 km above the lunar surface using NASA’s Lunar Astmosphere and Dust Environment Explorer (LADEE) spacecraft. The authors argue that this cloud is caused by high-speed bombardment by dust particles from comets. Interplanetary dust particles are thought to hit the surfaces of airless bodies in the solar system, generating charged and neutral gas clouds, as well as secondary dust particles that are ejected from the surface of the body on impact. Clouds of dust particles, bound by gravitational forces, have been found around the icy moons of Jupiter and Saturn. But until now, none had been identified around rocky bodies with dusty surfaces such as the Earth, Moon and Mars. Has lunar glow explanation turned to dust? The gravitational pull of the Moon is approximately one-sixth of that of Earth, which is thought to be too weak to maintain a permanent and substantial atmosphere. Instead, the Moon has a tenuous layer of neutral gas called an exosphere. Debate over the presence of dust in that exosphere has raged ever since sightings of the lunar horizon glow during the Apollo era. The team behind the study used an instrument called the Lunar Dust Experiment (LDEX) designed to study the physical characteristics and origin of lunar dust over a period of time, including during meteoroid showers. It was developed to search for a high-density dust cloud that could account for the glow seen by the Apollo astronauts. With superior sensitivity and closer approach to the Moon than previous missions, LDEX recorded 140,000 dust hits at various altitudes from the lunar surface and for a range of dust particle sizes. The team estimated the average total mass of the dust cloud to be 120kg. However, unlike the dust atmosphere’s of Jupiter’s moons, the lunar dust cloud is not evenly distributed or spherically symmetric. Instead, the authors found that the cloud is elongated in a way that matches the properties of the incoming interplanetary dust bombardment and indicates that comets are the dominant source of this dust rather than slower dust particles from asteroids. 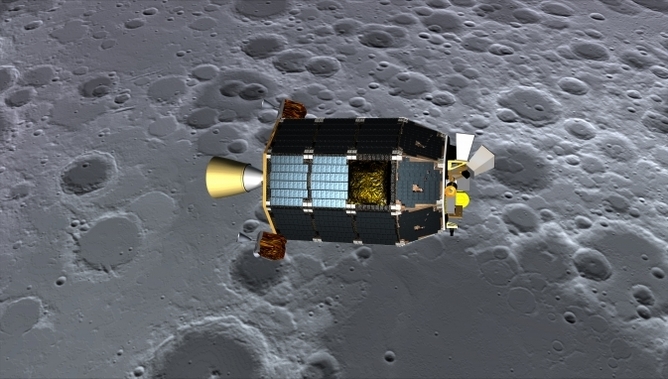 The LADEE mission ended with its planned impact into the far side of the Moon in April 2014 at a speedy 3,600 miles per hour, destroying and probably vapourising it on impact. For the origin of the glow seen on Apollo missions’, the team failed to find evidence of the relatively dense cloud of tiny dust particles lofted into the exosphere that would explain Apollo observations. 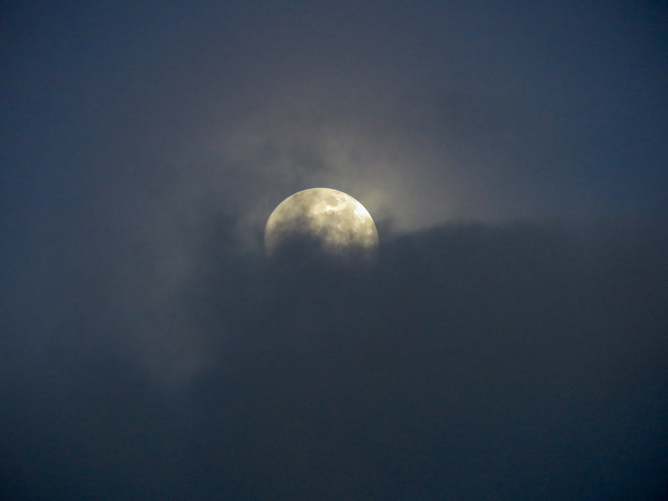 In fact, the cloud the study recorded was 100 times less dense than the Apollo missions had predicted. Although disappointing for those seeking an explanation, this may be more positive for future human exploration missions or aspirations to use the Moon as a base for conducting sensitive astronomical observations, which require a clear view of the sky. The result means that unless we want to dismiss the observations by the Apollo missions, we may need to re-assess our understanding of the conditions of the lunar surface and perhaps even the solar wind and resulting radiation field that was predicted to charge the dust and lift it into the atmosphere. Carole Mundell is Head of Astrophysics at University of Bath.